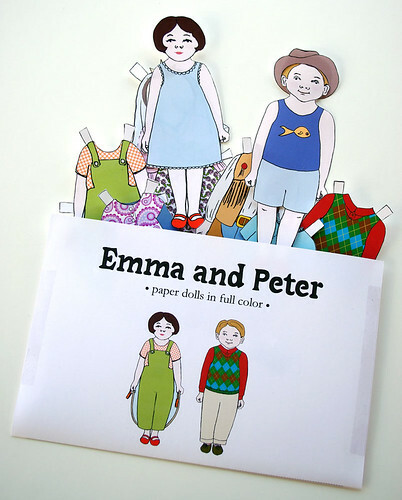 Another new set of paper dolls - I'm on a roll! Actually, I have some exciting new ideas so I'm finishing up projects that have been languishing for a while so I can move on, unhindered, to the new ones! These two little pals were drawn quite some time ago, but were never printed and tested until today. I've named them Emma and Peter. Choosing names for the dolls is fun. Sometime it takes a while, other times the choice is obvious. Names often suggest character traits and personalities to me - I don't know if that is due to past associations or if its just how the letters work together.